What is wrong with this weather? It’s almost October & my 7-day weather app is still calling for near 80 degree weather throughout the week! No amount of homemade soup, hot chocolate, twinkle lights, or Christmas socks seem to have any effect. My husband & I keep planning these fun fall dates & then end up staying in because it’s just way too hot. Seriously though, I really want to start wearing all those cute Anthro tops I bought for $9.95, but instead I keep pulling out all my sleeveless shirts I had already put away in anticipation of fall! Ok, ok. I’m done complaining about the weather now. It’s just that I really love fall!! 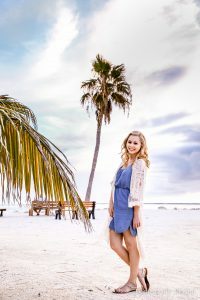 So to keep my mind off of the never ending heat, & since it is way too hot to make s’mores outdoors, I decided to create a new s’mores recipe that you can enjoy in the comforts of your own home! At first I thought about putting graham crackers underneath of the scones like a crust, then I thought about breaking them into small pieces & mixing them in like I did the chocolate chips & marshmallows. But as I sat at dinner a few weeks ago talking my husband’s ear off about S’mores Scones, he suggested I crush them up & add it to the scone dough. How brilliant is that?! So I turned my normal scone recipe into graham cracker scones! 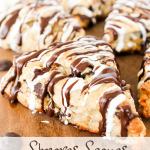 What I love about these S’mores Scones are the marshmallows! There are so many sweet pockets where the marshmallows melted into the the graham cracker scone, while a few of the marshmallows on top melted & turned a beautiful golden brown, just like they would if roasted over a fire! After debating what kind of icing would be best I decided to stay true to the s’mores theme. So I drizzled a marshmallow icing (created from marshmallow fluff, powdered sugar, & French vanilla creamer) & melted chocolate all over these crazy good S’mores Scones to complete the look & taste of s’mores! 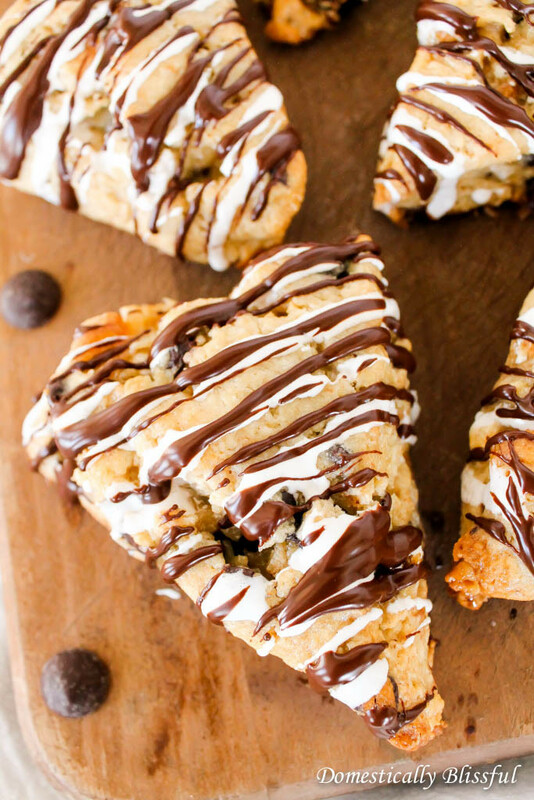 These aren’t your average S’mores Scones! 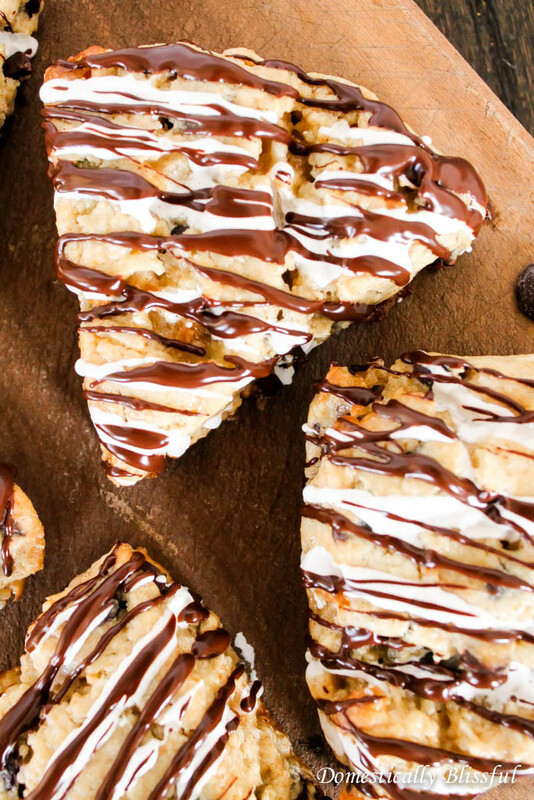 These are graham cracker scones filled with melty chocolate & pockets of sweet marshmallows topped with a drizzle of melted chocolate & marshmallow icing. First, preheat your oven to 400° degrees fahrenheit (*3), then in a bowl sift all of the dry ingredients – 1 & 1/2 cups crushed graham crackers, 2 & 3/4 cups flour, 2 tsp baking powder, 1 pinch of salt, & ¼ cup sugar. Next, fold in the 3/4 cup chocolate chips & 1 cup mini marshmallows. Split the scone dough in half, place both halves on a floured surface, & using your hands (with a little extra flour) shape the dough into round disks about 2 inches thick. 2 dough disks make 12 scones. 4 dough disks make 24 mini scones. 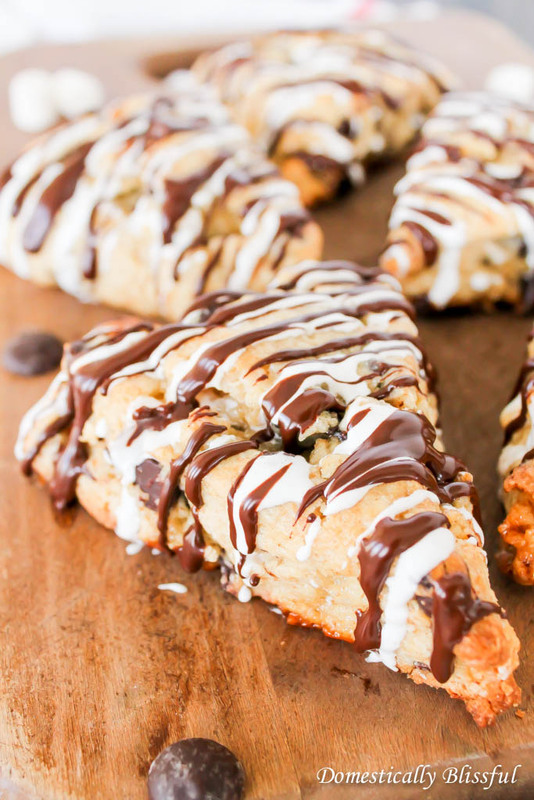 Cut the dough into scones with a pizza cutter or big knife. 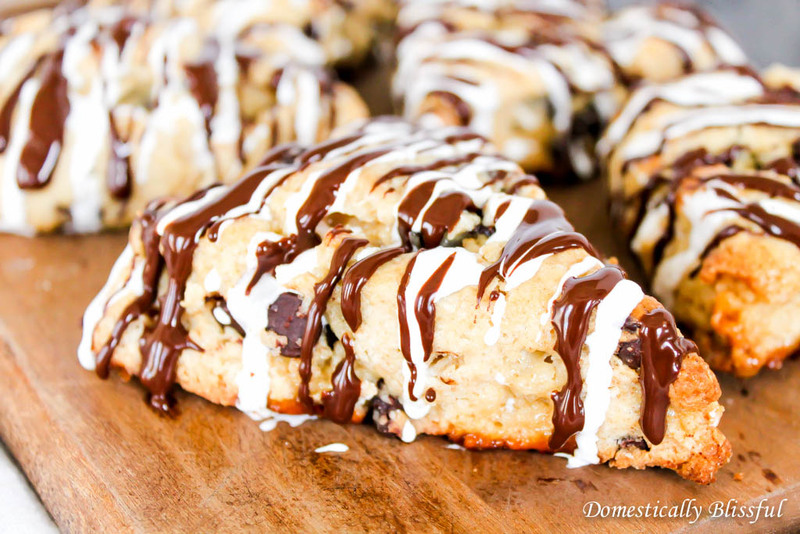 Place the scones on a baking sheet lined with parchment paper & brush the top of each scone with French vanilla creamer. 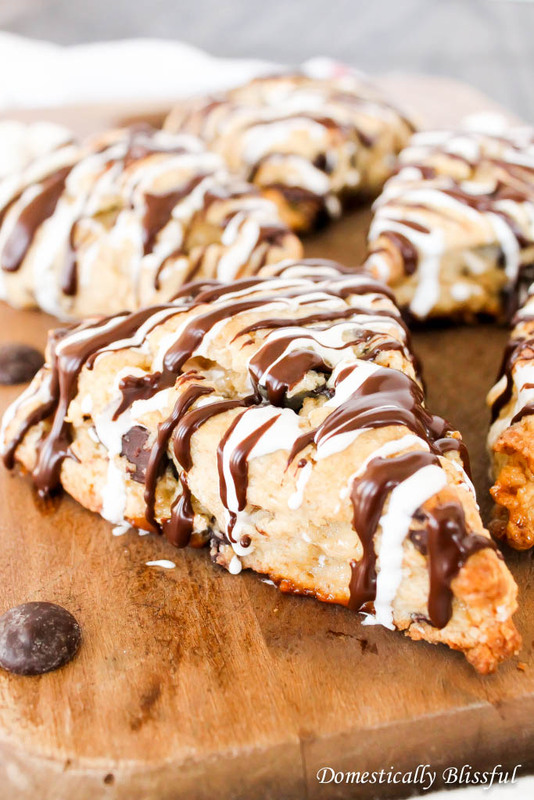 Your S’mores Scones are done baking when they are lightly golden on top. *1. This is approximately 1 package of graham crackers. To crush the graham crackers place them in a large bag & crush them with a rolling pin. *2. I cut my mini marshmallows in half by pulling them apart with my fingers. *3. If you plan on freezing the dough before baking hold off on pre-heating your oven. *4. You want the butter crumbles to be somewhat small, about the size of large peas, & dispersed throughout the dry ingredients. *5. Make sure that you don’t over mix, simply make sure that all of the ingredients are evenly combined to make a dough. *6. You can go ahead & shape/bake your scones if you are in a hurry, but I like to place my scone dough in the freezer for 30-45 minutes (covered in cling wrap) so that the butter gets nice & cold. That way when the scones bake there will be yummy pockets of butter in your scones! *7. For a thicker icing add more powdered sugar. For thinner add more French Vanilla Creamer. *8. When left in a sealed container the scones become too moist. 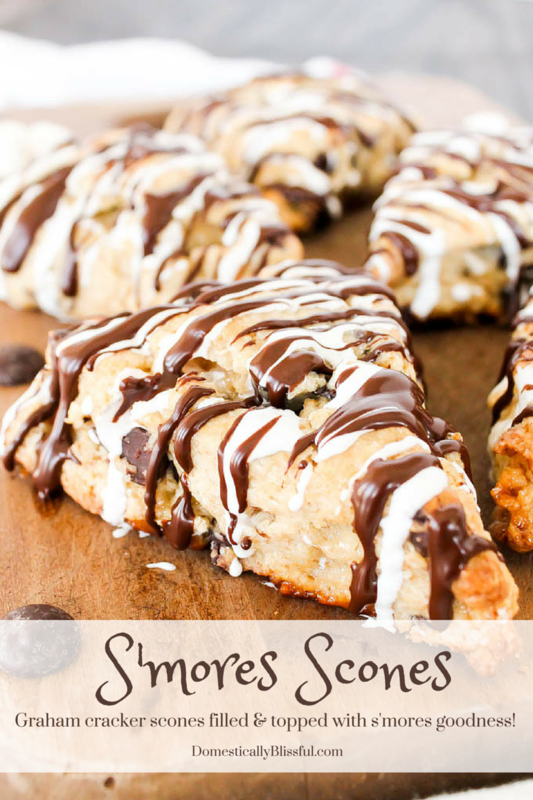 I’d love to see your S’mores Scones! I sought the Lord, & He answered me & delivered me from all my fears. Those who look to Him are radiant, & their faces shall never be ashamed.